Functional Food Technology Book from C.H.I.P.S. Through clinical and epidemiological studies, Functional Food Carbohydrates addresses the specific classes of carbohydrates that seem to exert health-enhancing effects. The text begins with in-depth treatments of the chemistry, physical properties, processing technology, safety and health benefits of a variety of carbohydrates including cereal beta-glucans, microbial polysaccharides, chitosan, arabinoxylans, resistant starch, and other polysaccharides of plant origin. Functional Food Carbohydrates also covers the physiological and metabolic effects that a variety of carbohydrates have on specific chronic diseases such as cancer, diabetes, cardiovascular disease, obesity, and various gastrointestinal disorders. 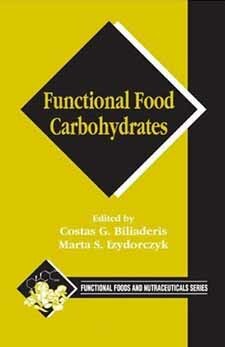 The final chapters discuss the regulatory and technological aspects of using carbohydrates as functional foods. The book considers the safety and efficacy of pre-, pro-, and synbiotics, and the potential use of carbohydrates as delivery vehicles for other bioactive compounds.